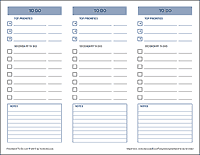 There are many methods for noting the priority of different tasks in your to do lists. One approach is to add stars or exclamation marks next to the high-priority tasks. Another approach is to use numbers or letters to rank tasks. You can also use underlining or circling or even change the size of your writing to indicate important items. In electronic form, such as Vertex42's original to do list spreadsheet, you can choose to mark a task as High, Medium, or Low priority. Then, you can sort tasks using the sort feature built into the software. 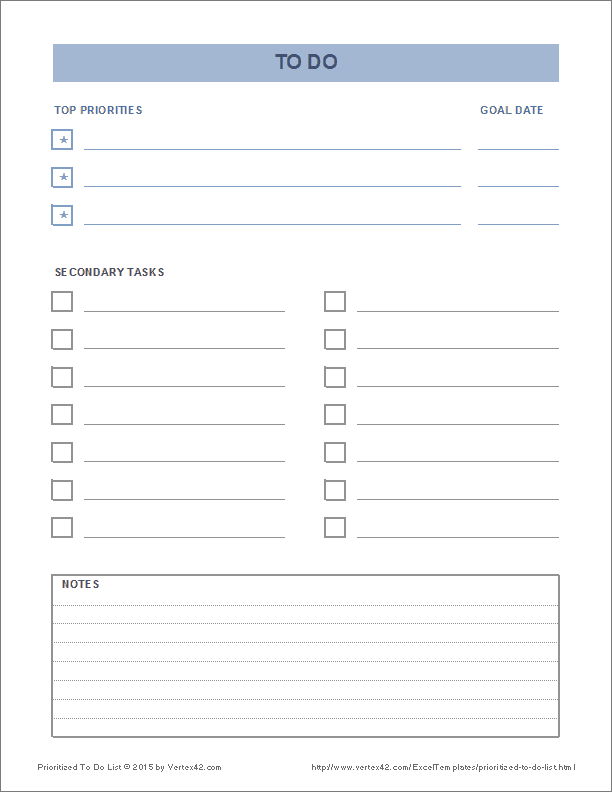 The template below is different because it is meant to be printed and completed by hand and it has a special spot dedicated to listing your top 3 priorities. 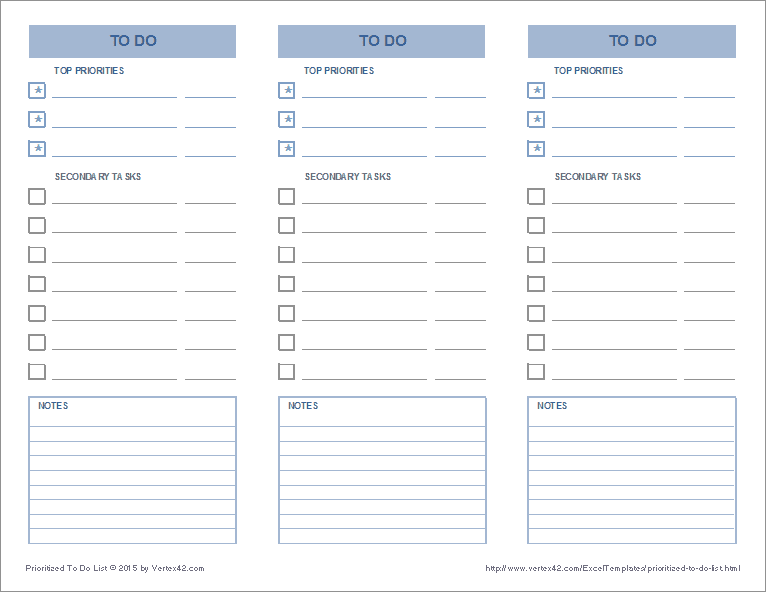 I particularly like the 3-column design, because I can use it to create a new list each day and conserve a bit more paper. Accomplishing all 3 of the top priority tasks for the day is highly satisfying. If you don't have Excel, you can download the PDF versions shown below and print as many copies as you need. This spreadsheet contains 3 separate worksheets, one for each of the 3 designs shown in the above screenshots. 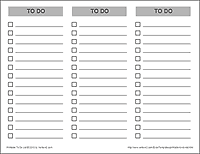 The principle behind the design of this prioritized to do list is that you have only 3 spots for the top priorities, forcing you to choose the top 3 instead of marking everything as high priority. Tip: Define your top 3 tasks so that they can be accomplished in the time you are given. This may mean breaking longer tasks into smaller steps. Use a separate list for your longer-term goals. 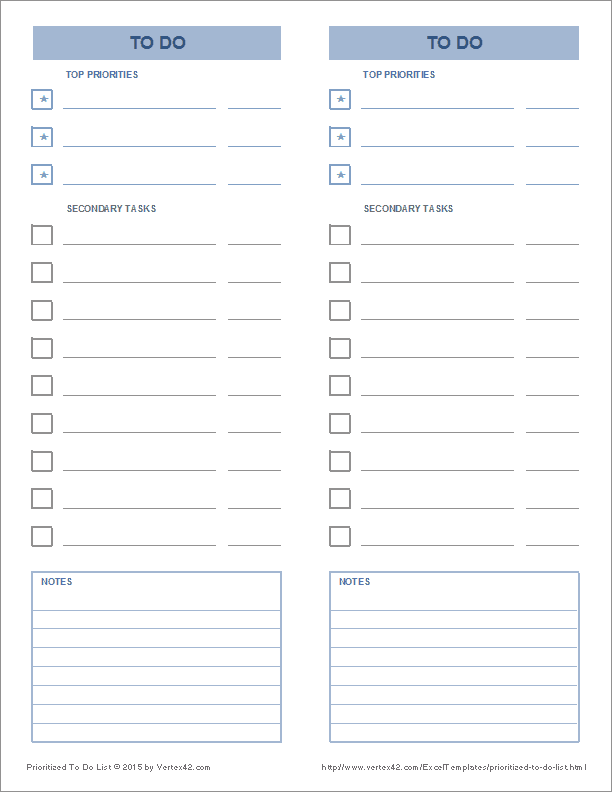 Your 4 Master Lists at briantracy.com - Brian Tracy recommends having different to do lists, including a master list and also monthly, weekly, and daily lists. 10 Common Time Management Mistakes at mindtools.com - Note that the #1 mistake is not keeping a to-do list and #3 is to not prioritize.